January 26 - Winter Dance Party at Chick Halls Surf Club. 9:00PM. Celebrating the life and music of Buddy Holly. Dagmar will be featured at the top of the show, so get there early! Hosted by JP McDermott and Western Bop. February 2 - Early Show at JV's. 5:00PM-8:00PM. The dinner hour at JVÕs rocks. Try the Seductones sandwich for starters. February 7 - Bangkok Blues. 7:30PM - 11:00PM. It's our first time here! Bring your friends for dinner, drinks and dancing. The refurbished Bangkok Blues features top-of-the-line, tongue-tingling Thai food, a stage and dance floor, a gold guitar bar with a dial that goes up to 11 not to mention the rockin' sounds of Dagmar and The Seductones! March 20 - JV's Restaurant. 9:00PM - 1:00AM. Wave goodbye to the snowy season and celebrate the First Night of Spring with Dagmar and The Seductones! May 10 - Quarry House. 9:30PM - 12:30AM. Dagmar and The Seductones debut at Rockabilly Saturday Night! Watch 'em raise the roof with the hi-voltage vintage sound of Bob Newscaster's guitar, Bryan Smith's bass, George Sheppard's drums, and Dagmar's sultry soaring singing style! There's room to dance and plenty of food and drink. June 8 - Summer on The Green. 6:30 - 8:00 p.m. A beautiful new park and a rockin' concert featuring Dagmar and The Seductones! Centrally located with a big fountain and lots of benches, bring your picnic supper from one of the surrounding businesses to this new space in Vienna, VA.
June 28 - Del Ray Music Festival. 8:30PM to 10:00PM - Dagmar and The Seductones. A celebration of the 100th Anniversary of Del Ray, Alexandria. Live music on two stages, plus food, fun, and games! Sponsored by Del Ray School of Music, The Birchmere, Acoustic Axis, Del Ray Centennial. July 17 - LIVE! On Woodrow Wilson Plaza. 12:00 noon until 1:30 p.m. A great venue - stop by for lunch with Dagmar and The Seductones! July 19 - Signal Hill Park Concert Series. 6:30PM-8:00PM. The City of Manassas Park brings Dagmar and The Seductones back for their annual summer evening concert. Signal Hill Park has picnic tables--so bring a snack; plenty of rolling lawn--so bring a blanket; even a water park complete with faux palm trees--so bring your pedalpushers and sunscreen; and best of all, Dagmar and The Seductones will be rockin' the old log stage--so bring your dancin' shoes! August 7 - Fort Ward Park - Twilight Concert Series. 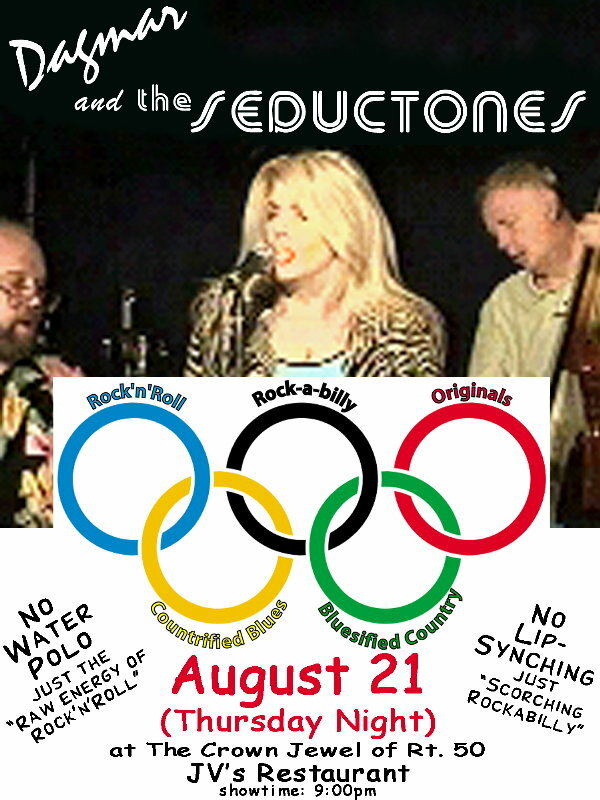 7:30 - 8:30 p.m. Rock'n'roll on a summer's eve at the Amphitheater with Dagmar and The Seductones! P.S.--Note to Fans: You can now see the video! August 21 - JV's Restaurant. 9:00PM - 1:00AM. Dagmar and The Seductones will be rockin' and rollin', boppin' and strollin' at the Crown Jewel of Rt. 50! 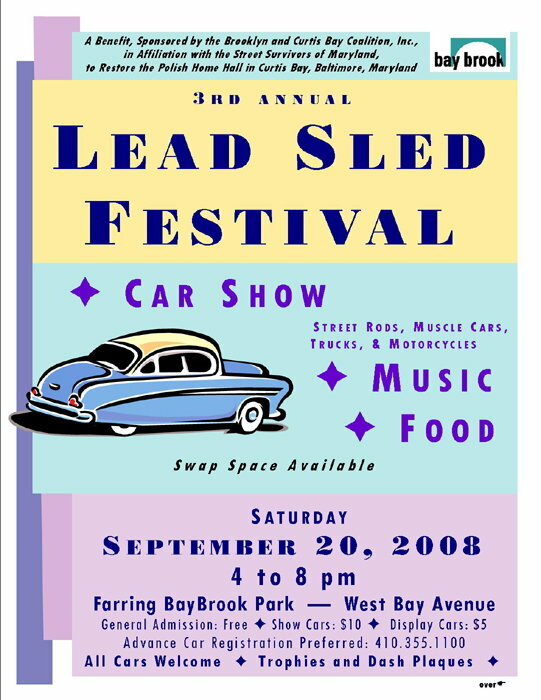 September 20 - Lead Sled Festival. Dagmar and The Seductones are pleased to headline the third annual Lead Sled festival celebrating Klassic Kars and Rock'n'Roll! In addition to the rockin' sounds of Dagmar and The Seductones and the great lineup of lead sleds, the festival will feature raffles, food and more. NOW AVAILABLE! The new video and the new photos! October 4 - Holmes Run Acres Day. 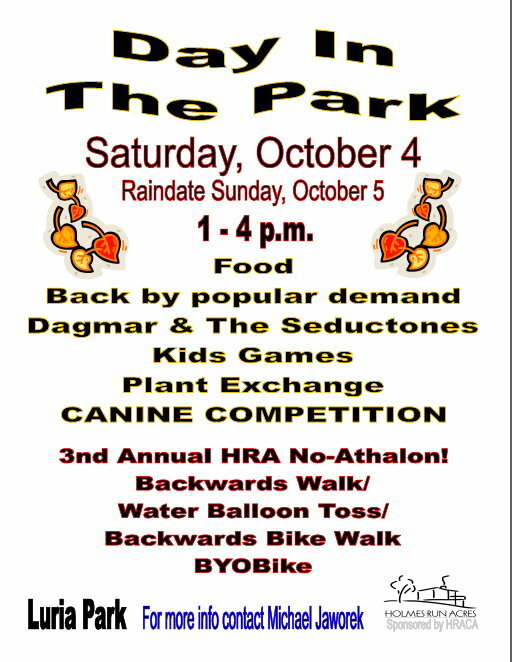 Annual neighborhood party (rain date Oct. 5) with food, games and music by Dagmar and The Seductones. October 30 - Patsy Cline tribute, JV's Restaurant. 9:00PM. Celebrating the life and music of Patsy Cline. See Dagmar and other guest stars--get there early! Hosted by Honky Tonk Confidential.